Grandmaster Lu Jun Hai (盧俊海) is a 6th generation heir to the Shaolin Mizong (少林秘宗) system of martial arts and a 9th Generation heir to the discipline of Qingping swordsmanship (青萍劍). He was born into a family of martial artists from Cangzhou in Northeast China. His father was Lu Zheng Duo (1903-1981), a famous Kung Fu Master and the former vice-chairman of Hebei’s Martial Arts Association. 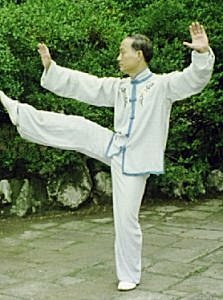 Grandmaster Lu began martial arts training when he was only six years old with his father, a leading authority on the Mizong system. He practiced year around, in the cold of winter and the heat of summer, never missing a day’s training. He spent three years just to perfect basic techniques. As a teenager, he accompanied his father to various martial arts competitions. The two-man fighting routines he performed with the father won rave reviews from appreciative audiences. Under the strict tutelage of his father, he devoted 30 years toward learning the entire Mizong system of martial arts. He won numerous awards at competitions for his performances of Mizong and Qingping sword routines. In the 1980’s, he was the martial arts coordinator of a popular Chinese TV series, “The Water Margin.” He was also awarded a certificate of meritorious achievement in recognition of his outstanding contribution to the preservation of traditional Chinese martial arts. He was head coach in Yang style Tai Chi for the Shanghai School of martial Arts, and was voted as one of the top 10 martial arts masters in Shanghai. Grandmaster Lu recently immigrated to the United Kingdom where he continues to teach at the United Kingdom Zhen Wei Guo Shu Institute as well as promote the martial arts.